Discover Labin gastro tradition and at easter brunch served by the sea. 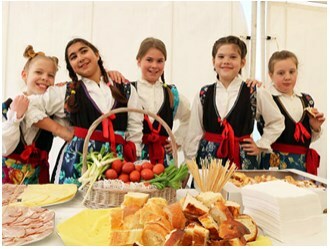 Local restaurateurs invite you to gather over the traditional Istrian Easter ingredients: cooked ham, cheese, škalonja (chives), Easter bread, hroštule (home-made cake) and Easter pinca (traditional Easter sweet roll, sweet bread loaf with the sign of a cross). At 11:30 members of RKUD Rudar from Raša, will dance the traditional local folk dance called balun, followed by live music, both Croatian hits and evergreens, performed by Trio Boom.